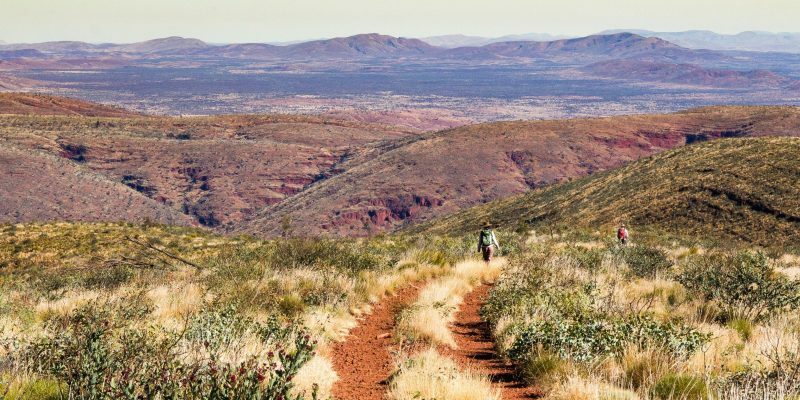 West Oz Active Adventure Tours is a boutique adventure tourism company based in the spectacular Karijini National Park. They are licensed to run canyoning, abseiling, climbing and hiking tours within the Park. 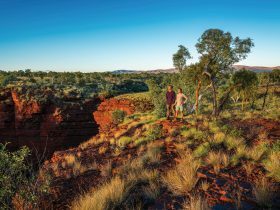 Their prime focus is about discovery and they use the magnificence of Karijini and the power of personal challenges to help you discover something about yourself and the majesty that is our natural world. With their licencing and experience, you can access most of the National Park including the restricted Class 6 gorges and see places seen by very few, other than in photographs. 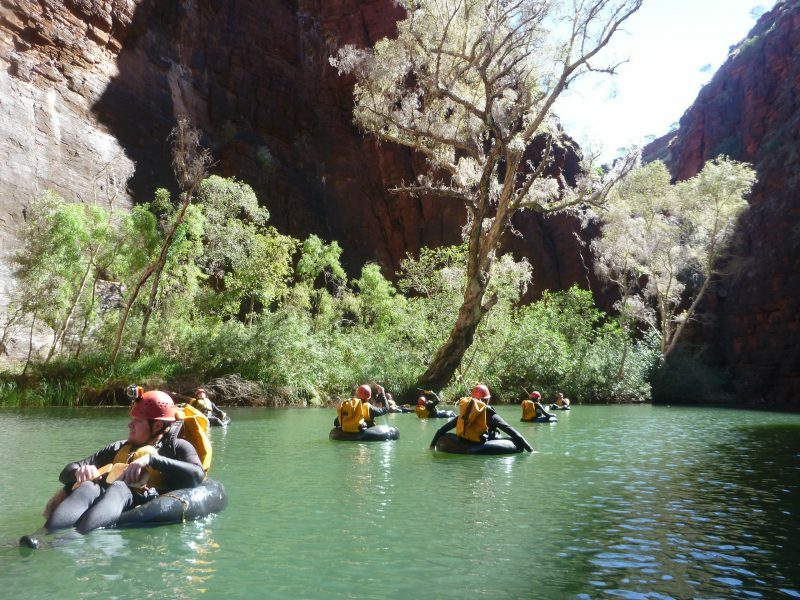 The outdoor adventure guides are fully qualified to help you discover Karijini with nationally recognised qualifications in roping, hiking, water activities and Wilderness First Aid. 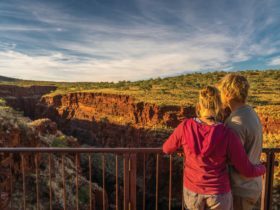 This is a very social and rewarding day of hiking, sliding, abseiling, tubing, climbing, traversing and discovering the natural beauty of Karijini National Park. 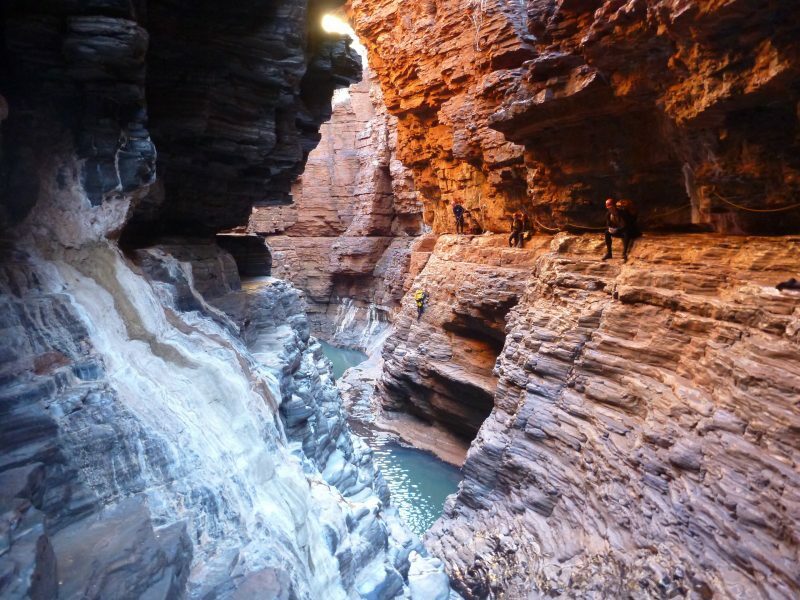 The trip commences at Knox Gorge and after a brisk hike, you are lowered into the Class 6 restricted area of the National Park. Slide straight off a four meter waterfall, then abseil down the next waterfall before reaching the stunning Red Gorge. With the aid of tubes and paddles, sit back, relax and enjoy the timeless country into Junction Pool where four gorges meet. You’ll stop for a well deserved break under Weano Falls. After lunch, you will make your way to Hancock Gorge and begin to ascend up through The Chute – a 45 degree incline waterfall and then onward to Regan’s Pool. You will rock climb out of Regan’s Pool and traverse to Kermits Pool exiting the Class 6 restricted area. Spider walking out, you will finish at the Weano day use area, for the bus ride back. This tour is not available during the winter months. This is their specially designed winter tour as they spend significantly less time in the refreshing waters of the gorges. This tour showcases the most spectacular scenery the park has to offer. It is highly requested by photographers and film crews. Entering Hancock Gorge you traverse 40 metres from Kermit’s Pool out into the Class 6 restricted area for a 12 meter abseil into Regan’s Pool. From there you will move around to Garden Pool and will lower yourself down The Chute, a 45 degree incline waterfall. You will get up close with the oldest exposed rocks on the planet as you enter The Centre of the Earth. Hopping onto the tubes and paddling to Junction Pool, you’ll stop for lunch and some sunshine under the spectacular Weano Falls. After lunch, you’ll retrace your tracks and climb up The Chute using a hand line and then challenge yourself to rock climb out of Regan’s Pool and traverse back to Kermit’s Pool. Spider walking out you’ll finish at the Weano day use area for the bus ride back to West Oz Active’s Headquarters. Explore the Class 5 gorges safely with someone who knows the best routes, handholds and footholds. Enjoy the majestic beauty of the National Park whilst learning about the geology, ecology, flora and fauna. 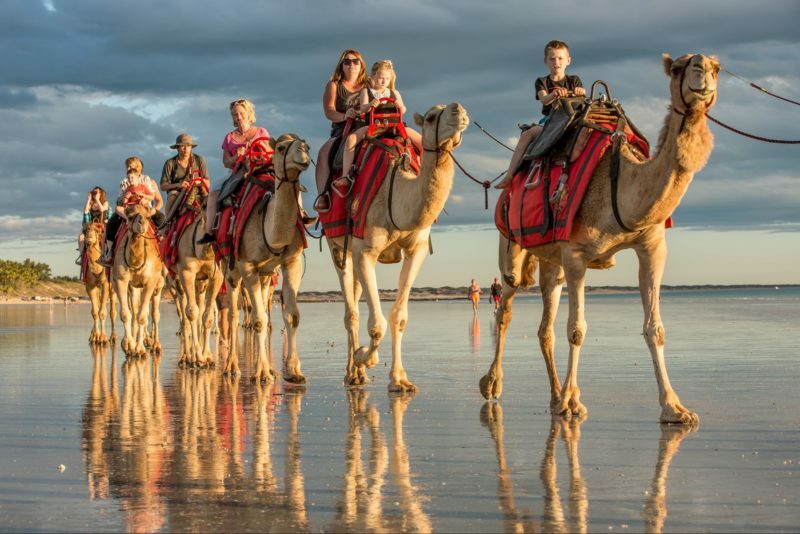 Tours will be conducted by nationally accredited outdoor adventure guides who carry full emergency response first aid kits and emergency communications on all tours. No roping activities are involved in this tour and you can choose from either a full or half day tour.